British weather doesn’t have the best reputation. 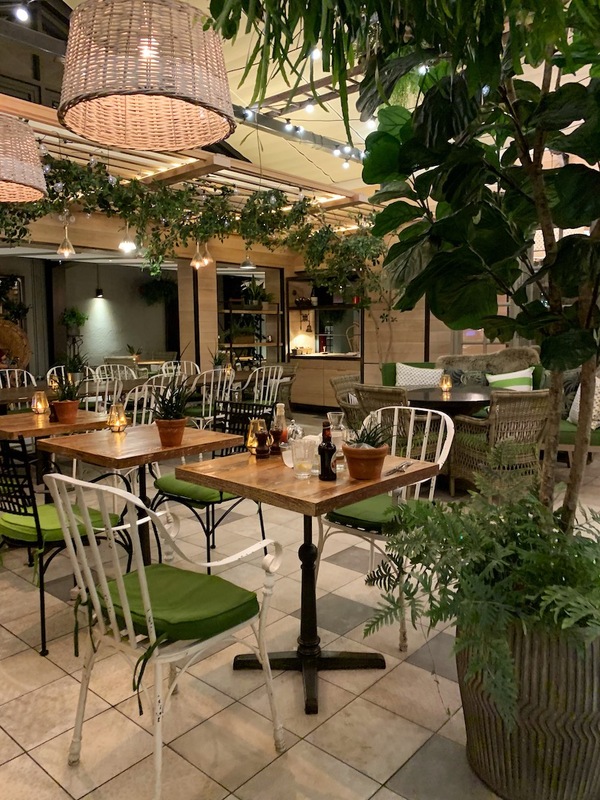 The unpredictable nature, and especially rain in this part of the world isn’t really ideal for having outdoor get-togethers. So how can you guarantee an enjoyable (and dry!) 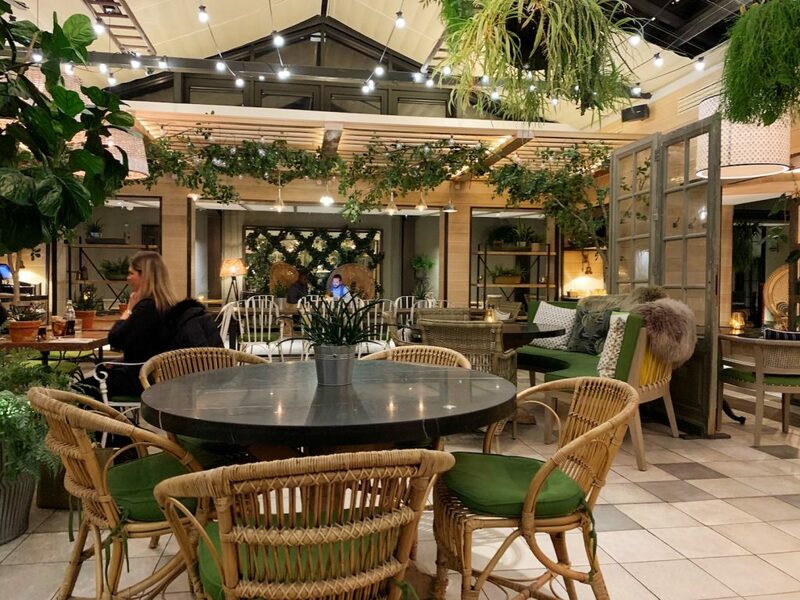 afternoon tea in a garden setting? 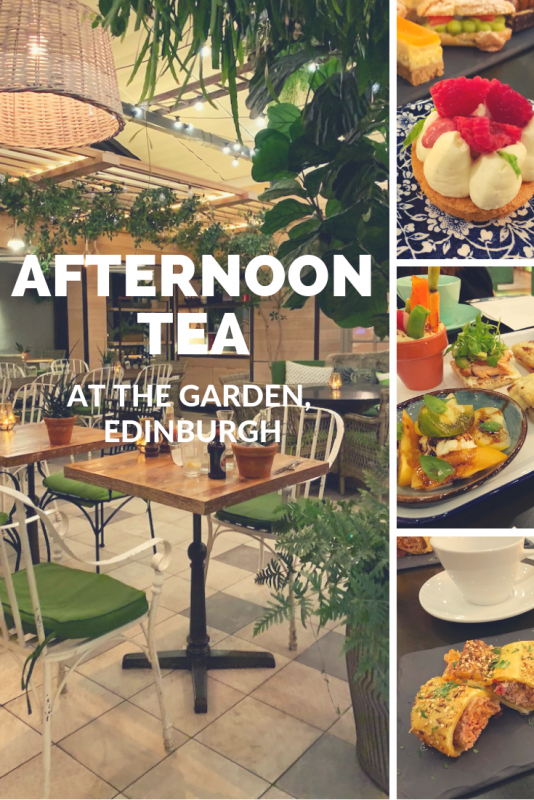 In Edinburgh, the answer is at The Garden, The Principal Edinburgh Charlotte Square’s restaurant serving all day meals, drinks and of course, afternoon tea. But this is not your typical afternoon tea. 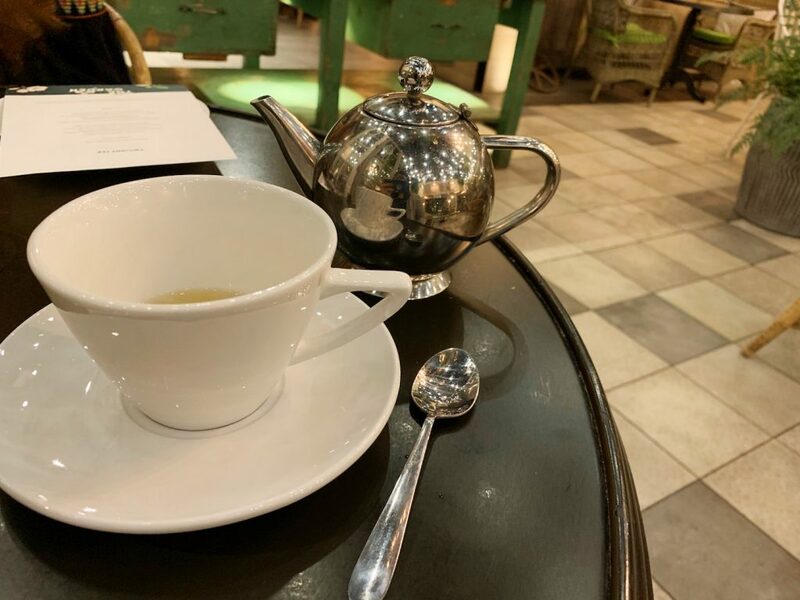 Tea time at hotels and restaurants around the city are typically between the hours of 12pm and 5pm. At The Garden, it extends all the way to 10pm for a unique experience called Twilight Tea. I walked to the The Principal Edinburgh Charlotte Square from the Royal Mile. After doing a little afternoon exploring, it only took about 15 minutes to walk from the Edinburgh Castle to the hotel. Edinburgh is a very pedestrian friendly city. So if you’re staying at the hotel and enjoy walking, everything is easily accessible by foot. A few steps through the front doors of The Principal Edinburgh Charlotte Square, will lead you to the reception desks. Keep walking straight, past the desks and through double doors to arrive at The Garden. I’ve never had a chance to have an afternoon tea past 6 pm. 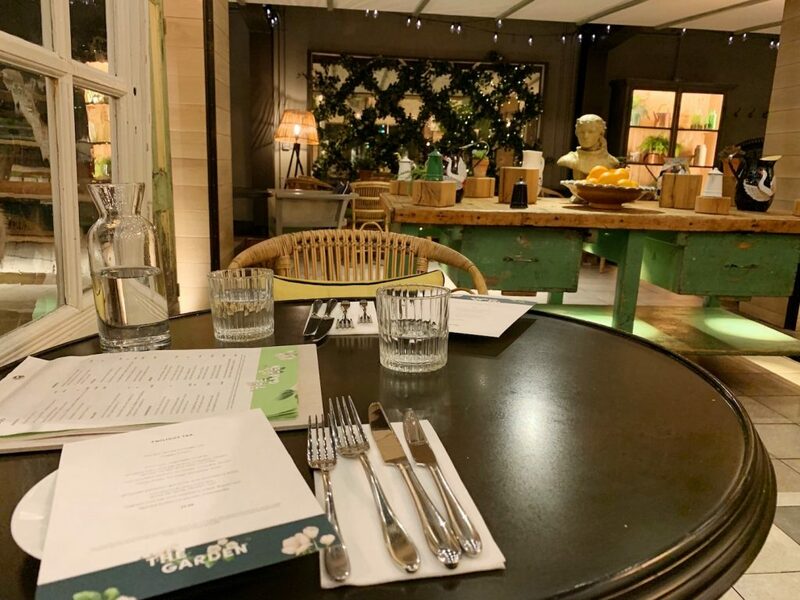 Since The Garden’s is offered until 10 pm, I figured I’d arrive later than I usually would for afternoon tea, and settled for a 5 pm reservation. At that time on a Tuesday evening, I noticed a few guests sitting around with a drink and their laptops. There were two groups having dinner. And a handful of groups in suits, probably business travelers discussing… well, business I’m assuming. Overall, it was quiet, and really felt like being in a fertile oasis in the middle of a bustling city. It was practically dinnertime when I had this afternoon tea at around 5:30 pm. Although I always go for a black tea, I felt this afternoon tea called for an herbal tea instead. I chose a Cornish Peppermint from Tregothnan Estate. As mentioned, this isn’t a typical afternoon tea. 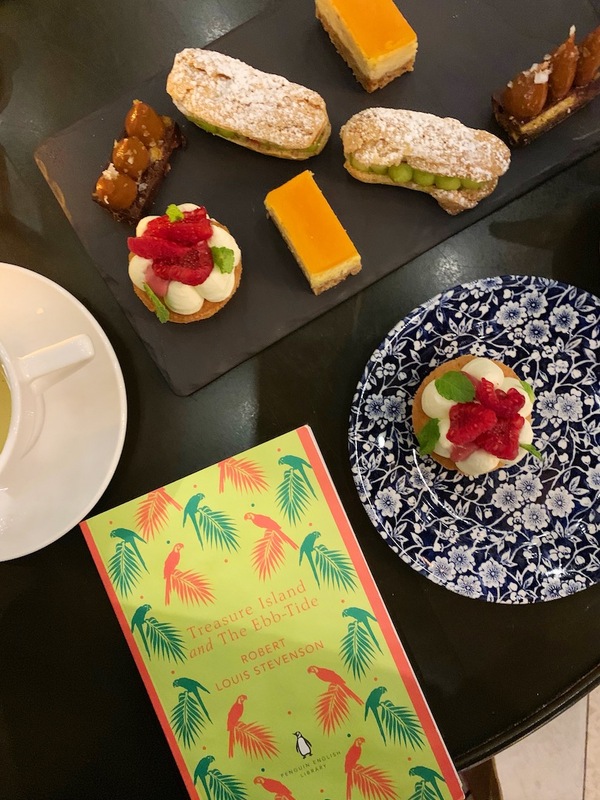 You won’t find a three-tiered cake stand or scones (which to be honest, I was very excited about because I already had three afternoon teas before this one and as much as I like cream and scones… too much of one thing isn’t good… but anyway…). The first course was a platter of savories. Included was a small terracotta plant pot filled with hummus and vegetable crudites. 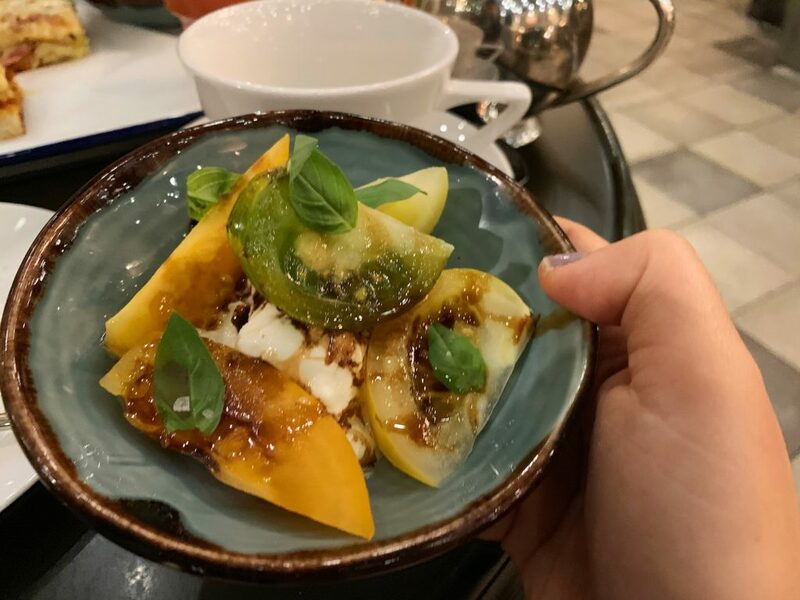 There was also a small refreshing plate of mozzarella, heritage tomatoes and basil topped with balsamic vinegar. And two sandwiches – smoked ham and Isle of Mull cheddar rarebit, spiced tomato and raisin chutney (my favorite!) and one with salmon, avocado and Crowdie (a Scottish fresh cheese). Next came another platter with meats. 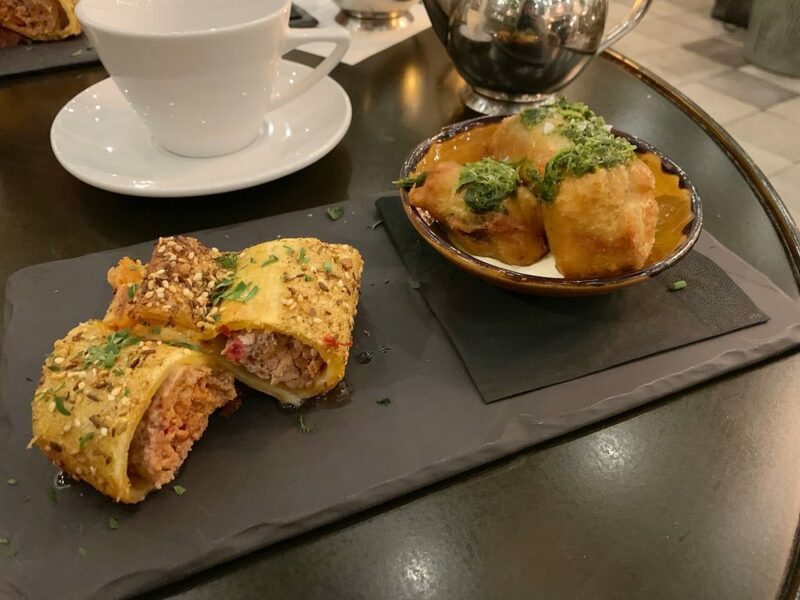 To the left of this picture is Harissa-spiced sausage rolls and to the right, haggis fritters. Being in Scotland, I loved that there were Scottish touches to this afternoon tea. One being haggis. I’ve had it a few times and don’t mind it… (did you know you can even purchase canned haggis!?). I think you’ll enjoy it more if you don’t know what it’s made of. So if you don’t know what it is, I won’t tell. Don’t google it and just try it. Lastly, were the desserts. An eclair with whipped pistachio ganache and strawberry, a honeycomb chocolate bar with dulce de leche and Maldon salt (my favorite! ), yoghurt mousse and raspberry sable Breton tart and a spiced butternut squash cheesecake. 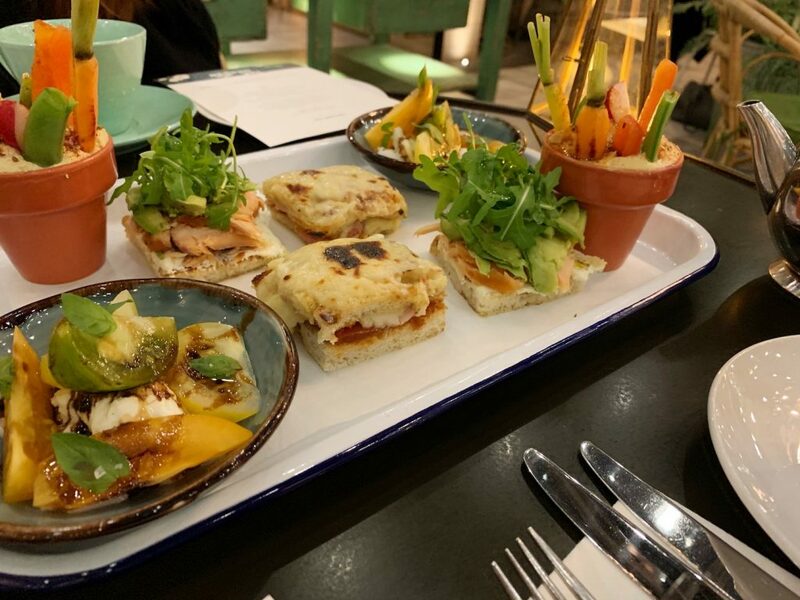 As a non-traditional afternoon tea, food is served on rectangular serving platters and black slate cheese boards. We were checked on frequently and were always equipped with hot water for our teas. There is free WiFi accessible through the hotel’s network. The Principal Edinburgh Charlotte Square is on Twitter and Facebook. You can also follow the Garden’s Instagram account. 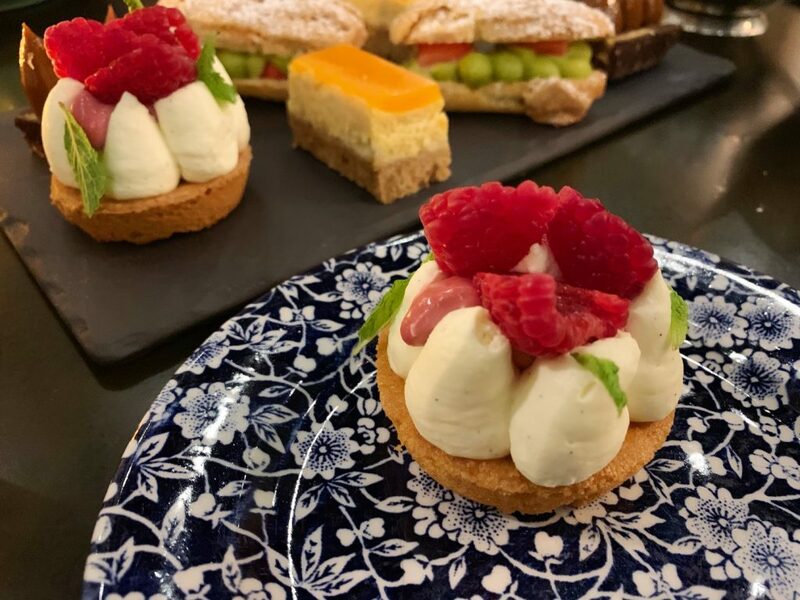 For a unique afternoon tea with a few Scottish touches, afternoon tea at the Garden in The Principal Edinburgh Charlotte Square is the place to go. 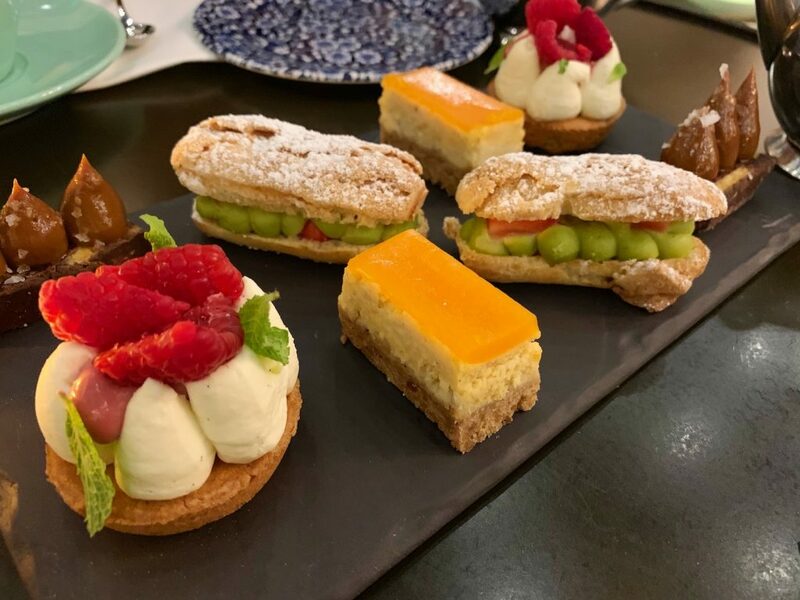 I loved that I could go for afternoon tea late in the evening and that it’s mainly centered around savory items, which have ingredients that are distinctively Scottish like haggis and crowdie. Note: A big thank you to The Principal Edinburgh Charlotte Square for providing the afternoon tea for this review. As always, all views and opinions are my own.